Dr. Kari Codispoti is a graduate of Georgetown University and NYU Medical School, and currently resides in Farmington CT with her husband, Vin, and two beautiful daughters. Growing up, she managed to avoid running at all costs until one day in college she decided that running a mile without stopping was a life skill she needed. 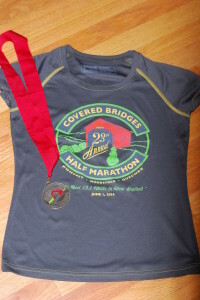 The Covered Bridges Half Marathon was Kari’s first half marathon and only second race, but now she is hooked and looking for her next event to take on. My husband, daughters, and I relocated to the Upper Valley in New Hampshire or a year. 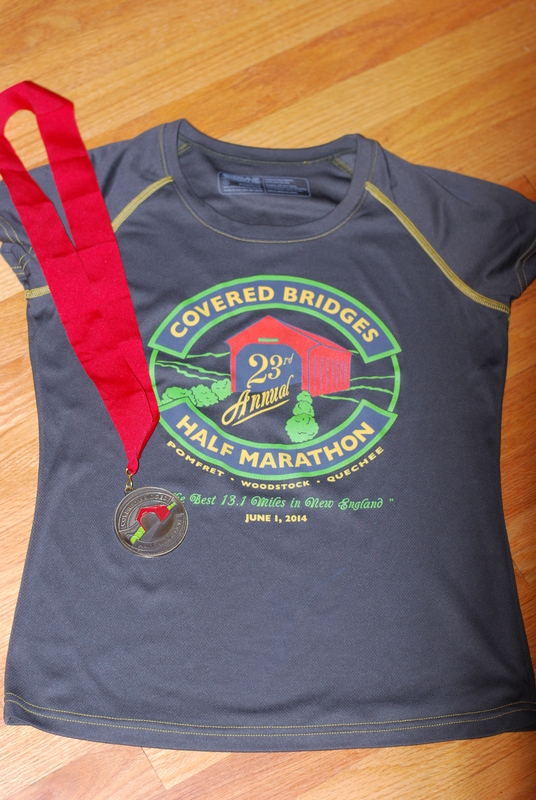 After being there a few months, I heard from several people that the Covered Bridges Half Marathon was a great race and I should try it. I’m lucky that I got into the race as it filled up in just 14 minutes! 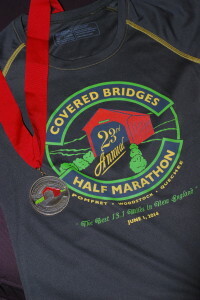 My first half marathon yielded a nice shirt and shiny medal object. Training for this event was a bit of a challenge as I only had 2 mornings a week to run (the mornings my oldest was at preschool) and had exactly one hour (the treadmill time limit at my gym) each time for most of the winter. Right now, I am sure lots of people are slapping palms to their foreheads over the thought of training for a half marathon on a treadmill, but when its winter and you have limited training time, you have to do what you have to do! Once spring hit and New Hampshire thawed out, I took advantage of the local rail trail and increased my mileage. I am not the kind of person who likes surprises so I worked up to a 14 mile run about a month before the race and then tapered down after that. I think this cut down on any pre-race jitters since I knew I could run the distance. This is a small race (less than 3000 total runners) so they don’t really have an expo. Bib pickup is the morning of the race (see below). They do have an information booth on the Woodstock Green the day before the race, but I didn’t go. There is also a pre-race pasta dinner, which you can buy tickets for, but I also didn’t participate in that. There is not much swag with this race. They hand out t-shirts after you cross the finish line. This year it was a fitted tech shirt, which I love. Disclaimer: apparently I live in a hole and am unaware of all the “gear” that runners use. Anyway, I wore my Nike dri-fit running shorts that I have had for way too long, a sports bra, and a (gasp) cotton t-shirt. On my feet were Brooks Adrenaline GTS 14 running shoes. I do care a lot about what is on my feet and after Saucony changed my beloved Pro-grid Guide, I tried these and fell in love with them. A slightly more artistic picture of the cool race logo and SMO. This is a point to point race so your options are to be dropped off at the start or to park and take the 10 minutes or so bus ride over. I opted for the latter. Parking was easy (in a giant field) and there were lots of volunteers directing everyone. Port a potties were available in the parking lot. I got on a bus right away. The start is at the Suicide Six Ski Area and this is where you pick up your bib. It was a seamless process which took less than 2 minutes. Bag check was equally easy. They provided plastic bags and you just dropped it off at the school bus by last name (A-M, N-Z). Bagels and bananas were provided. I resisted the temptation as I had already had my standard pre-run breakfast (don’t judge) of 2 cups of black coffee and a bowl of granola. There were lots of port a potties but even though lines weren’t really organized, the wait wasn’t too long. The course starts at the Suicide Six Ski Area in South Pomfret, Vermont. It is a mass start and the beginning goes through some farmland, which was absolutely beautiful and everything I loved about living in this region of New Hampshire and Vermont. It goes past Billings Farm into Woodstock, which is where the majority of spectators are. Just before you get into Woodstock there are some very small hills, but overall it’s fairly flat. This part of the race is on paved roads. Race Icon. The course crosses the Middle Covered Bridge. There are 3 other bridges you go by along this course, but this is the only bridge you actually get to run over. After Woodstock you follow along the Ottauquechee River. This part is a dirt path and there is some decent tree cover here too. Around mile 8 there is a steep hill, but it’s really short. 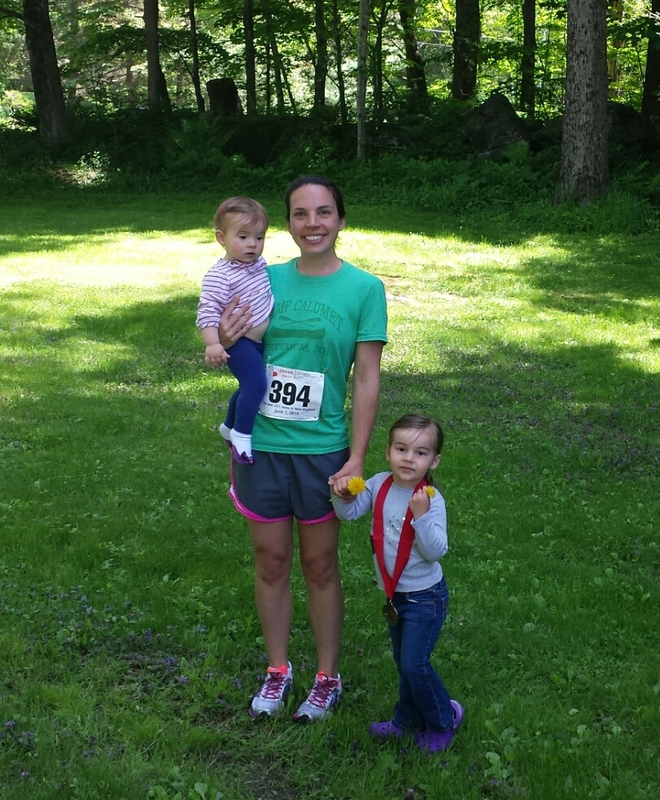 The course then goes through the village of Quechee, past Dewey Pond, and finishes at the Quechee Polo Field. Entertainment is scattered throughout and is a mix of local music groups that ranged from a solo accordion player, high school jazz band, to a local rock band, but my favorite was the blue grass group from the Dartmouth Outing Club. Me, my girls, and yes, my cotton shirt. As you cross the finish line you are quickly given a medal and then you move past the t-shirt pick up. Since I was by myself and not meeting anyone, I hadn’t planned to stay for much other than a little hydration. After being alone with my thoughts for the race (I don’t use an IPod) I found it a little over-stimulating with everyone milling around and all of the music, etc. I think I saw a station where free massages were being given. There was a ton of food: bagels, watermelon, yogurt, and so forth. There was lots of water and soda, but by the time I was there all the Gatorade was gone, which I found annoying. There was beer but I didn’t venture that way since I had to drive home. Bag pickup was just as easy as the drop-off was. Bags were laid out in alphabetical order on a hill and it took me less than a minute to get my sweatshirt and head out. I loved this race. It was special to me for several reasons. Even though we were only in New Hampshire for one year, I grew really attached to the region. There was so much about this race course that incorporated all that I love about the area. I also was running the best I have ever run prior to the race and thought I might be able to come close to the 2 hour mark. The race day weather was perfect. I started closer to the front of the mass start than I belonged, and as result I started out FAST. I think my first mile was the fastest mile I’ve ever run. I had to consciously tell myself to slow down over the first 3 miles. I took a couple miles to find my pace and I did the first 6 miles in just over 52 minutes. I finished in 2:00:56 and was so excited. 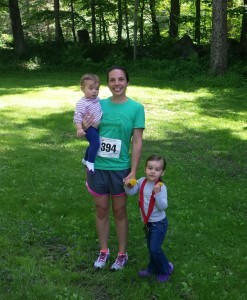 Although now I wish I skipped a couple water stations and had those 56 seconds back! 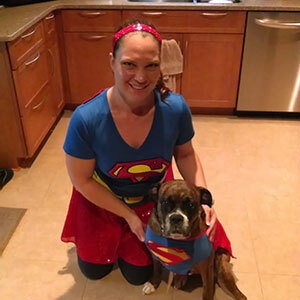 Sounds like an awesome race, Kari!